Just 8 simple steps for gorgeous and unique weatherproof cushions. 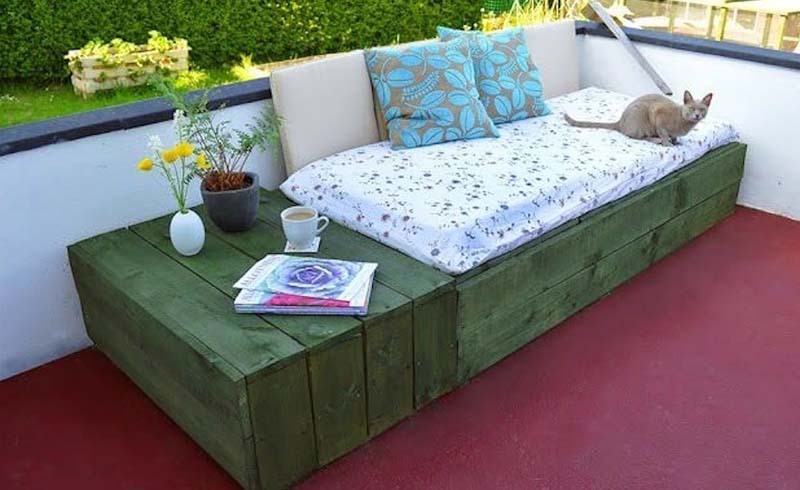 Warm temperatures and gorgeous weather are here to stay, so why not make the most of it and decorate your outdoor space? With Beci Orpin's new book Sunshine Spaces, you can DIY lots of useful (and cute) projects for all things outside. 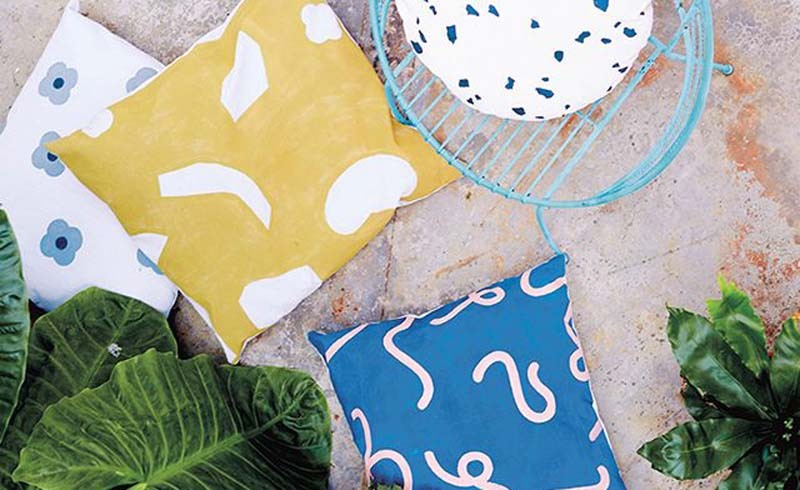 Start with something easy to make like these personalized outdoor cushions and you'll be a crafting connoisseur in no time. NOTE: For the cushion fabric, I used a plastic-backed canvas drop sheet (bought from a hardware store) that measured 12 x 5 ft. This was enough for the four cushions shown above: one 25 1/2 in. square, two 19 1/2 in. square and one 19 1/2 in. round (there will be fabric left over). Step 1: Cut your top fabric roughly to size, leaving about 4 in. allowance over final size. Using the wide paintbrush, paint the base colour on the fabric side of the material. You don't want the paint to be too thick – water it down slightly if it is. TIP: Using a roller to apply the paint will make it easier to apply a thin layer. Step 2: Once the base coat is dry, draw your design onto the fabric. Step 3: Using a small paintbrush, paint the design. Leave the paint to dry thoroughly. Step 4: Mark out the final size and shape of the cushion using the pencil. For the round cushion, use a circular object such as a sunhat or plate as a template (remembering to accommodate for seam allowance). If you are making a square cushion, measure and mark out the desired size. Mark out the fabric for the base of the cushion at the same time. Step 5: Pin the painted top fabric and the plain base pieces together. Following the pencilled lines, cut out the two pieces of fabric together. Step 6: Pin the right sides together (the plastic sides should be facing out, so they end up on the inside of the cushion). Sew around the edge on a sewing machine, leaving a 4 in. opening for the stuffing. Step 7: Remove the pins and turn the cushion right side out. Fill the cushion with the stuffing. Step 8: Close the hole with hand stitching.